The Liverpool Catholic Reformatory Association was formed in August 1863 and decided to set up a local 'Ship Reformatory' for Roman Catholic boys. A thirty-seven-year-old warship, the Clarence, was converted and equipped for the purpose and moored on the Mersey at New Ferry, near Birkenhead. On August 3rd, 1864, the ship was officially certified as a Reformatory to accommodate 200 boys aged from 12 to 14 at their time of admission. The Clarence was to have a troubled history. In September 1882, there was a mutiny on board the ship. Several of the ring-leaders received prison sentences. In the same year, a boy was brought to court after found trying to set fire to the vessel. On January 17th, 1884, at around 1.30pm, a fire was discovered in the bows of the ship in an area where oil cans were stored. 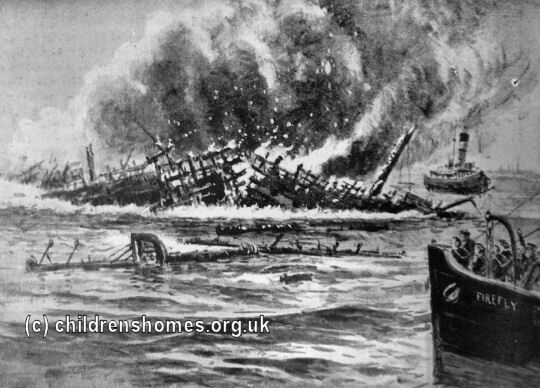 The flames soon took a firm hold and it was soon apparent that there was little hope of saving the vessel and, still blazing, it was rammed and sunk the following morning. Happily, the 216 boys and seven officers on board the ship had been evacuated safely and spent two nights sleeping aboard a steamer named Gypsy Queen. The boys were transferred to a newly built sanitary hospital at Bebington. The reduction in security that occurred enabled sixteen of their number to abscond during the night. 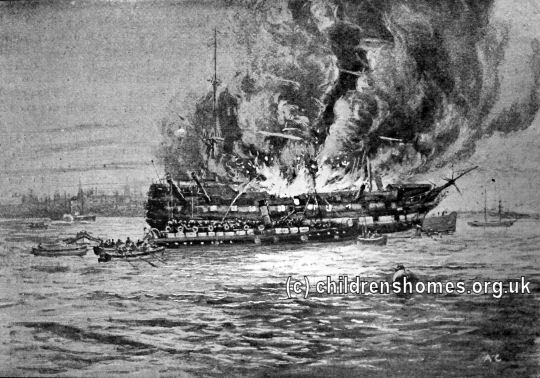 An overheard conversation amongst the boys suggested that the Clarence had been set on fire deliberately, with some of the escapees implicated. Two weeks later, seven boys from the ship appeared in court charged with setting fire to the vessel. All were found guilty and sentenced to five years penal servitude. The boys were subsequently transferred from the hospital to the disused Mount St Bernard Reformatory premises at Whitwick in Leicestershire. The buildings were adapted for their new residents and the usual nautical exercises were continued just as if the boys were on board ship. There were also classes for tailoring, sail-making and net-making. Somewhat reluctantly, the Admiralty eventually offered the ship's committee a replacement ship. The Royal William, renamed Clarence, was moored on the Mersey under the command of a new Captain Superintendent, E. P. Statham. The ship was officially certified on November 19th, 1885, to accommodate 300 boys. Trouble flared up almost immediately, however, with a mutiny by the boys. Boats coming alongside to help were capsized when the mutineers threw the ship's whalers and launches on top of them. The Head Schoolmaster, Frederick Potter, was also stabbed and nearly died from his wounds. The riot was only quelled when Captain Statham threatened the boys with a pistol which, as it happened, was not loaded. The ringleaders of the mutiny were placed before the Assizes. Fire struck the Clarence again, in the early hours of July 26th, 1899. Two Mersey steamers, Vigilant and Firefly, immediately came to assist as the 235 boys on board were evacuated, together with Captain Yonge and his family, and Bishop Allen of Shrewsbury. The Bishop was on board prior to a confirmation ceremony for twenty-four boys that had been due to take place that day. Four hours after the fire was discovered, the ship broke in two, with one still burning section staying afloat for some time. As before, the fire had been started on purpose. For several weeks, some of the boys had been stockpiling old rags and other flammable material in the depths of the hold. The fire had been lit deliberately to coincide with the Bishop's visit to the ship. After the fire, the boys were briefly housed at 111-113 Shaw Street, Liverpool. They were then moved to Mold, in North Wales, in premises that were renamed St David's Reformatory for Roman Catholic Boys. In September, 1901, they were transferred to the disused premises of the former Kirk Edge Orphanage near Bradfield, West Yorkshire, which then became the Kirk Edge Reformatory until November, 1905. Perhaps not surprisingly, the Catholic Reformatory Association, who operated the Clarence, decided not to reinstate the vessel. Instead, they switched to land-based nautical training and established the St Aidan's Nautical School at Farnworth, near Widnes. Liverpool Archives, 3rd Floor, Central Library, William Brown Street, L3 8EW. Holdings include: Register of Juvenile Offenders committed to Reformatories by Magistrates of the Borough of Liverpool (December 1854 - January 1860, includes person's details and name of Reformatory where sent); Roll of Juvenile Offenders under Detention in the Clarence Reformatory, (December 1890 - November 1898).